The train station is located at the northern end of Matlock Bath. 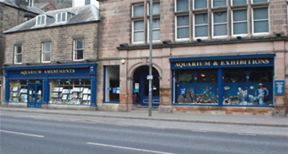 The Aquarium is just a short walk from the station, by crossing over the main road and heading south along the parade of shops etc. There are hourly Monday to Saturday train services to Matlock Bath from Derby, Long Eaton, Beeston and Nottingham. On Sundays direct trains operate from Nottingham Beeston, Long Eaton and Derby every two hours. 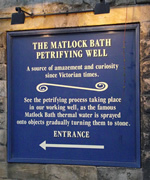 There are frequent bus services to Matlock Bath from all the major surrounding towns and cities. This includes hourly transpeak Trent Barton services from Nottingham, Derby and Buxton with less frequent links from Manchester. 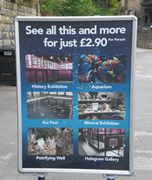 Please mention Matlock Bath Aquarium if you are making a booking. 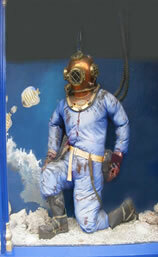 Matlock Bath Aquarium is located in the centre of the village of Matlock Bath. Situated on the A6, 18 miles north of Derby. 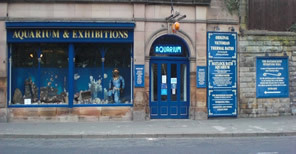 The entrance is almost opposite the Victorian iron bridge spanning the river Derwent. PLEASE NOTE: during holiday times this car park can get very busy and alternative car parking can be found at the southern end of the village in the Temple Car Park as you enter the village on the A6 from the south and also in the Artists Corner Car Park as you approach the village from the north (Matlock).